Two EDUCAUSE Review articles reported on research conducted on the use of eTexts. The first article, published in 2015, focused on the benefits to instructors and was based on research done during the eText pilot. This study used analytics from the eText system and a follow-up series of interviews with a small number of faculty eText adopters. The second, published in 2017, focused on the benefits to students and analyzed three years of student use of eTexts from 2013 to 2015. The sections that follow draw extensively from these two studies. During the pilot phase of IU’s eText initiative, data was collected from courses in which the instructor opted to use an eText. From spring 2010 until fall 2011, actual eText usage by approximately 2,200 students in 28 courses was examined through review of e-reading platform logs and a survey of self-reported reading behavior, perceived learning, and future preferences. The final sample included 1,081 students from 18 sections of 11 different courses, for a response rate of 49 percent. Courses in the pilot study ranged from business to history, language, telecommunications, psychology, and astronomy. According to students, only half of the instructors actively used eTexts in their courses. An instructor’s active use of eTexts in a course affected student experiences with eTexts. All of these comparisons were statistically significant according to Pearson’s chi-square test for independence. That is, student experiences of eTexts were more positive if they felt an instructor actively used eTexts in the class and shared annotations with students. This finding was also supported by the fact that 70 percent of the surveyed students chose instructor highlights and notes as an important factor in preferring eTexts over paper textbooks (see the figure below). When instructors are not actively using the eText, the findings aligned with existing research that shows students read more with paper textbooks and they underutilize available features of eTexts. However, instructors are key stakeholders in formal education regardless of the textbook’s medium. As the study suggested, they are also instrumental in guiding student behaviors and attitudes regarding eText use to enhance learning benefits. Although other studies also highlight the critical role of instructor eText adoption and use of enhanced features (i.e., shared highlights and annotations) in student eText experiences, no research has examined instructor motives for adopting eTexts or how instructors use eTexts in their courses. At IU, we had a unique opportunity to address this gap by interviewing instructors who actively used an eText in their course for at least two semesters. Electronic textbooks can be affordable alternatives to paper textbooks. However, savings from eTexts do not realize their intended value, actual learning, if the eTexts are not actively used. With features such as search, shared highlights and notes, digital accessibility from multiple devices, and reading statistics, eTexts have the potential to enhance learning experiences when both instructors and students engage with them. Student data from the pilot phase of the program demonstrated that an instructor’s active use of the eText for a course is associated with a higher percentage of students reading and taking notes in their eTexts. Not only do students find instructors’ highlights and notes useful for learning, but they also consider these features as important as the lower cost of the eText vs. a print textbook when deciding to use eTexts. Therefore, more active instructor engagement with the eText may encourage higher adoption of eTexts by students. According to these instructors, shared highlights and notes can serve as another channel to communicate with students about the reading materials. These highlights and notes can also aid in-class activities and studying for exams. The instructors in the study did not change their teaching pedagogy when using an eText, but did report higher use of eTexts in the classroom compared to paper textbooks—in particular, thanks to the search function and the fact that every student had access to the text. Simply put, when instructors engage with eTexts, so do their students. The findings from the study suggest that instructors play an important role in eText adoption by modeling active eText use and creating meaningful interaction around the content. Therefore, professional development for faculty around best practices in using eTexts can help instructors and students embrace and make the best use of eTexts for learning. To sum up, eTexts can offer higher returns on the cost savings when both instructors and students take advantage of the available features. This study looked at usage data from the Engage e-reading platform for undergraduate courses offered in face-to-face settings in fall and spring semesters only. We also excluded data from the spring and fall semesters for spring 2013 to spring 2016. The study encompassed 865 courses and 2,242 sections with over 68,000 registered students. How much do students read their eTexts? The answer to this question relies on page views. The Engage database records a page view when a user stays on an eText page for at least 10 seconds. (Note: Data is unavailable if a student with a disability uses an accommodated text; this could mislead an instructor as to their participation and level of effort.) This threshold aims to differentiate between browsing and reading activity, according to the Engage developers. Viewing a page for at least 10 seconds serves as a proxy indicator for reading. For all semesters combined, over 46,000 students viewed more than 15 million pages of eTexts. This total includes multiple viewings of a particular page for review and studying purposes. Students could access their eTexts before the first day and after the last day of class. Nearly all page views (98.6 percent) occurred during the regular semester. But even though only 0.4 percent of the total page view records occurred before classes started, on average eight percent of the students in any semester opened or explored their eText before the semester. Similarly, page views after the end of the semester constitute only one percent of total page views, with about 10 percent of students each semester re-visiting their textbook after the course finishes. Reading pattern per semester. As evidenced by two figures below summarizing weekly activity for fall and spring semesters, respectively, the general reading activity for students closely followed the term schedule. Substantively more reading occurred within the first four weeks of a term, followed by a small decline before a slight increase. Since the data comes from undergraduate courses, this pattern probably corresponds to assessment activities for courses. Drops in activity corresponding to semester breaks for the fall and spring terms (Thanksgiving and spring break, respectively) also support this pattern. Following these breaks, activity is somewhat reduced and likely follows concluding course assessments like final exams. Lastly, the reading activity corresponds with the use of interactive markup features, which suggests that most markup occurs during reading as opposed to reviewing. Time of day. Using actual time stamps from Engage records, page views across all courses in fall and spring semesters were examined by the hour of day. 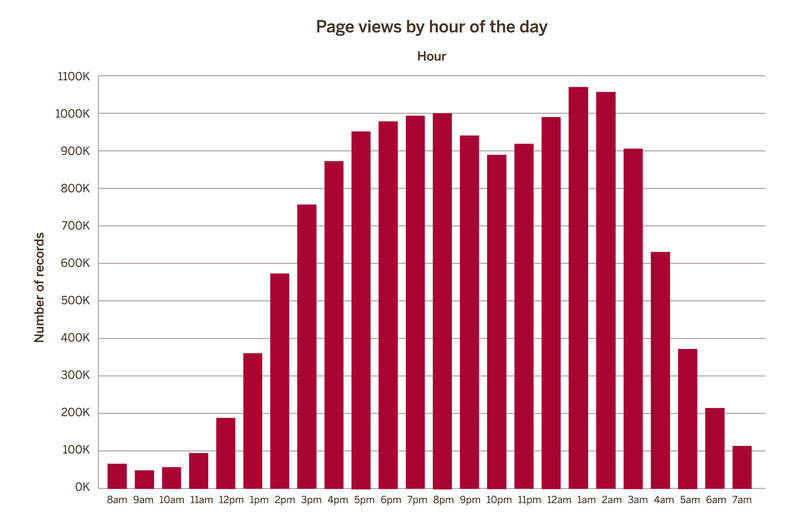 In a 24-hour time window, students viewed 26 pages on average. Students’ reading activity started slowly in the morning (3,404 students with 15 page views per student) and intensified through the afternoon into the evening and night. Although reading slowed down between 9pm and midnight, it picked up after midnight and reached peak levels between 1–2am (30,604 students with 35 page views per student). The number of students studying dropped sharply after 3am until 7am in the morning. 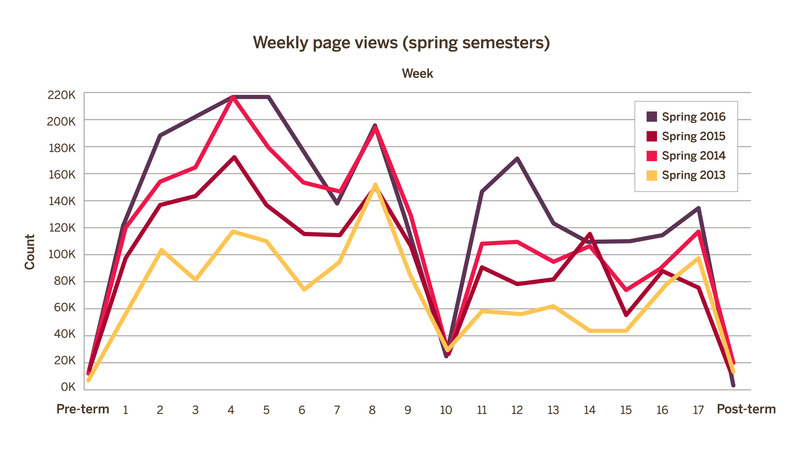 Given that most of the eText courses in the sample were taught face-to-face during the day, the pattern in hourly page view activity indicates that students used their eTexts mostly for self-study. 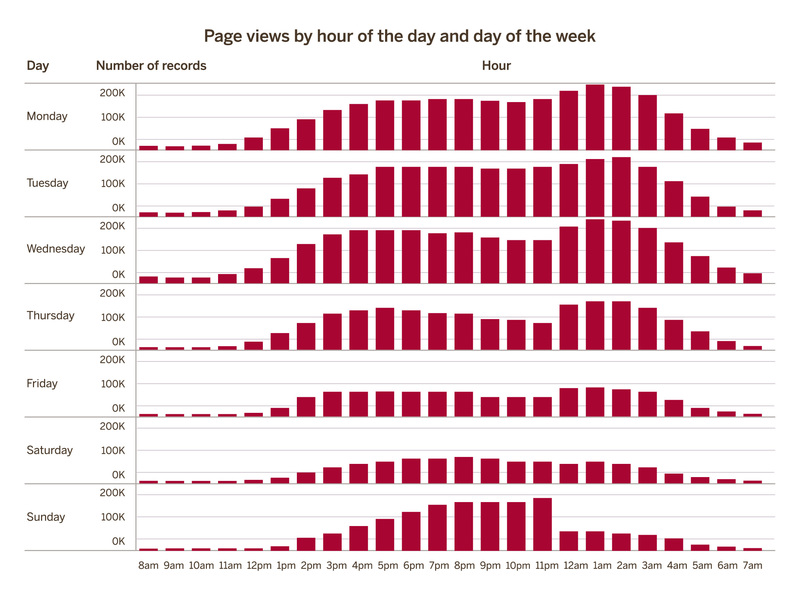 Examining hourly page views by day of the week also elicits interesting study patterns. As the figure below demonstrates, students tend to follow the same study routine Monday through Thursday, when most of their studying from textbooks occurs in the evening and late night. On Friday and Saturday, the volume of page views decreases sharply. On Sunday, students resume studying in the afternoon. 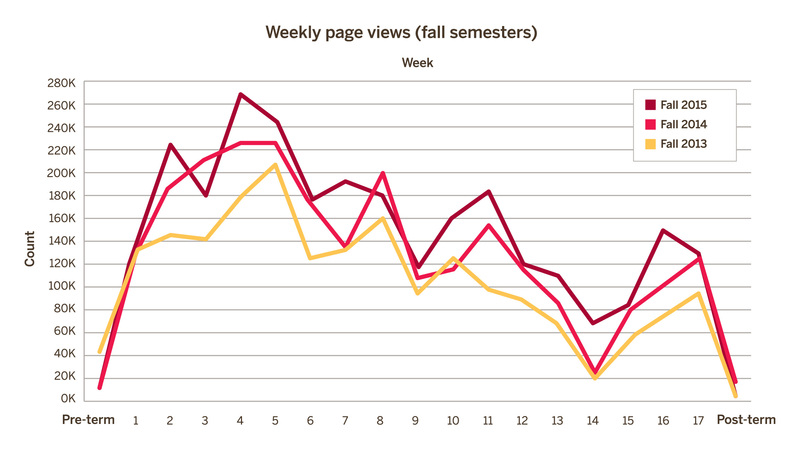 Unlike other days when peak study times extend past midnight, the number of students studying after midnight on Sunday more than halves, resulting in a sharp drop in page views. How does eText use impact grades? A meaningful answer required a large subset of IU Bloomington student grade data, combined with Engage records. 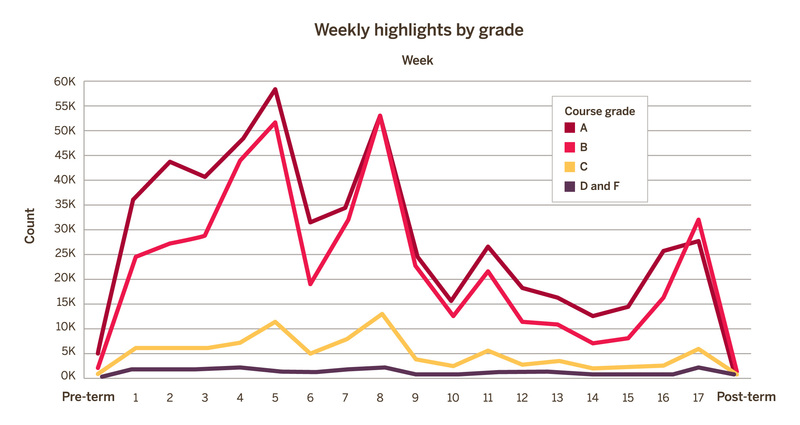 As the figures below indicate, high-achieving students (A and B grades) made the majority of page views and highlights. 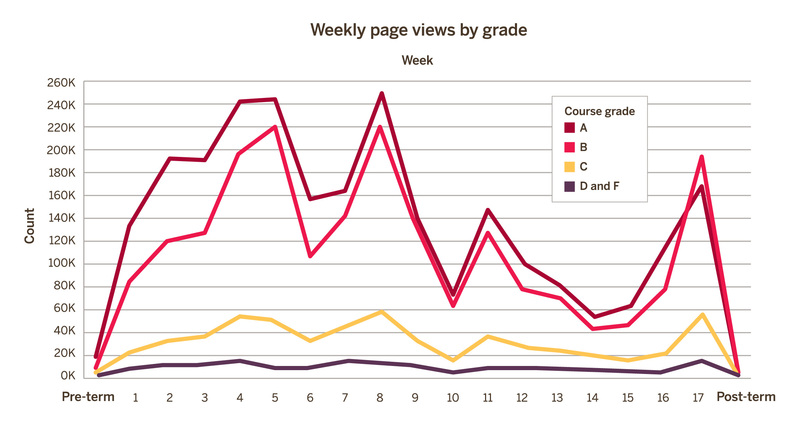 Average performing students (C grade) had substantively less page view and markup activity across all terms. Finally, students who had an unsuccessful outcome (D and F grades) had little to no activity in either accessing the eText or using interactive markup features. In general, then, these data support the expected pattern of higher engagement with reading materials relating to higher performance within courses. This pattern of higher engagement leading to higher performance (upon further analysis and statistical testing) might provide indicators for inferential and predictive work with e-reader data. When connected to additional data sources (e.g., learning management system and assessment data), e-reader activity data can be used to develop predictive and supportive models for assisting and improving student success within higher education — especially when a course is designed around taking advantage of such data. In fall 2016, a university-wide Learning Technologies survey was conducted using a random sample of all students, faculty, and staff. The survey’s purpose was to assess awareness and use of specific teaching, learning, and collaboration services/technologies. Ten percent of the student sample from three different campus profiles (Bloomington, Indianapolis, and regional campuses) responded. Students who have used an eText were asked to respond to two open-ended questions regarding what they liked most and least about their experiences. A total of 379 students commented on what they liked most; a total of 376 students commented on what they liked least. These comments were coded by two readers with 95 percent inter-rater reliability. Several themes emerged from the positive and negative comments (figure below). As was the case with the earlier faculty study, the results point to a conclusion that educators and educational researchers have long known: More engagement with and access of course materials leads to more positive outcomes for students. Often unknown, however, are the types of access and resources used by students within specific educational contexts, especially when most of their activity occurs outside of formal educational spaces. eText readers can provide possible insights into both the degree and kinds of engagement employed with course materials. On its own, this information is unlikely to yield effective and efficient analytic models of student engagement. However, when coupled with other data sources corresponding to learning activities and spaces (e.g., LMS activity), the development of predictive systems for course instructors and academic advisors becomes a real possibility. An additional factor to consider in the adoption and implementation of eText readers is the possibility of positively affecting students’ reading practices and instructors’ pedagogical practices. The IU eText reader, Engage, offers instructors and students opportunities to collaboratively interact with the reading materials through the tool platform. However, as this data reveals, instructor use of the tool’s interactive features was minimal in most cases. While the reasons likely vary between instructors and courses, the data indicates the need for additional training on the effective use of the platform. To address this need, IU is currently creating both a professional development module for instructors and an online orientation module for students about “learning with eTexts.” These modules will be guided by John Dunlosky et al.’s effective learning techniques. Instructor modules are self-paced online modules that will also be used for “teaching with eTexts” workshops at the campus centers for teaching and learning across IU. The online orientation module specifically targets students set to take a course with eText. We hope that by gaining insights into the various features available within Engage, both instructors and students will increase their engagement with eTexts, thereby contributing to better student performance. See: Internet2 eTextbook Spring 2012 Pilot Final Project Report. August 1, 2012, https://www.internet2.edu/media/medialibrary/2013/10/07/eText-Spring-2012-Pilot-Report.pdf and Susan Grajek, Understanding What Higher Education Needs from E-Textbooks: An EDUCAUSE/Internet2 Pilot (Research Report), Louisville, CO: EDUCAUSE Center for Analysis and Research, July 2013, http://www.educause.edu/ecar.